contemporary design, strong &amp;amp;amp; durable. We sell quality products with 100% money back guarantee. Can be used for many purposes around the home. 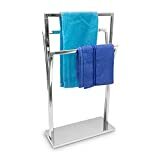 Free-standing towel holder for bath towels, bathrobes, etc. 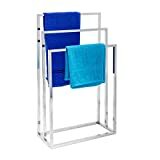 Free standing hand towel stand with 3 rails for space-saving drying of hand towels and small bath towels – also ideal as a coat rack for your bedroom. Functional – The gently curved holder in different heights provides optimal air circulation – your clothes dry faster and without the emergence of unpleasant odours. Made from metal in stainless steel look and chrome-plated finish – the elegant design integrates well in your bathroom and gives the hand towel stand a modern, discreet look. 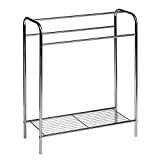 Secure grip on stable base – Plastic Base Prevents scratches on the floor – The Towel Holder needs no drilling so is ideal for your rented apartment. Quick and easy assembly with included mounting hardware and installation instructions (cannot guarantee instructions are in English) – Overall dimensions (H x W x D): approx. 86 x 50 x 20 cm – Length of rods: approx. 50 cm. ELEGANT DEISGN - Chrome finish works well with any bathroom or shower room design. 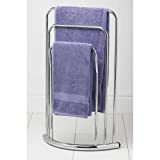 With 3 towel rails to hold upto 3 towels or bath sheets. NO DRILLING, NO MESS, NO WORRIES - No need to worry about hitting pipes, damaging tiles, or installing a bathroom towel rail in the wrong place. You can move a freestanding towel rack around till you find the right spot. ORGANISE - keep your towels off the floor, looking neat and keep them dry. As it's portable if you don't have a radiator in your bathroom you can easily move it to create an improvised heated towel rail.